The community of Ista Weyr is a friendly evironment that is driven towards group interactions and TPs run by all of it's members. We welcome all who are interested to come by and visit or join in the fun! Ista, the fifth Weyr, is one of the most curiously constructed. Situated on the bay at the southwest corner of the Big Island, the black half volcano thrusts four fingers and a thumb into the tropical sky. 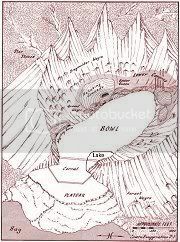 The mountain must have been formed by an eruption that knocked the bay half off its caldera into the sea, letting lava flow in a gradual drop-off, which the pounding of the current has worn away into a plateau. For all its tiny size, Ista has a mind-boggling, maze like warren of narrow tunnels that double back and run into each other.The beach under Ista Weyr is sand that, when inspected, proves to be black diamond dust. Supplementing the lack of dragonrider weyrs are 'forest weyrs,' cliffside dwellings on the outer face of the Bowl. In addition to its Hold Ista's coverage areas include Nerat, a portion of Igen, and a lower part of the Keroon Peninsula—however not that of Keroon itself. Ista, though one of the smallest Weyrs, is also the best situated: based on a subtropical island wafted by sea-born breezes. The living cavern is always full of people going about their business and you're more than welcome to join in! @move to #2070 or snag a boat from the mainland to explore. Feel free to @send *isf or page any of the staff with questions. If you'd like to become a resident write *isf with your request. There are a few requirements to keep in mind, namely that you have a programmer's bit, that you have a reasonable description, and we'll need a /short/ written history blurb from you (send it to *isf). Think about what sort of job you'd like to do as well - everyone at the Weyr works in some capacity or another.